Basement waterproofing is one of the most physically demanding jobs I have ever done. The following information is not intended as an instruction manual. It is my hope that this general description of the basement waterproofing process will illustrate for my customers what to expect—and what should be expected from a good waterproofing vendor with a good waterproofing system. After using a jackhammer to break out the concrete around the entire perimeter of the basement, to approximately eighteen inches from the wall, it is time to pull the broken concrete out of the trench and carry it out of the basement to the truck. Once all the concrete is removed, it is time to start digging a trench approximately twelve inches wide and ten inches deep around the entire perimeter of the basement. This trench leads to a large hole about three feet deep and three feet wide for the sump pit. The trench and sump hole must be large enough to hold the four-inch perforated pipe and sump pit with plenty of surrounding rock for drainage. If there is any mold present, this is an excellent time to bleach the walls and hose off the floor to ensure a clean work area. Everything can be hosed right into the trench. After the trench and sump hole are dug and all the material is hauled away and the work area is clean, it is time to start installing the system. If you have a block foundation the next step is to drill weep holes in every core and mortar joint of every block as low as possible to allow any water that is in the blocks to drain completely. After all the weep holes are drilled, it is time to hang the sealer. I normally hang the sealer twelve inches high. The purpose of the sealer is to guide the water from the weep holes into the trench. The sealer allows me to drill weep holes above floor level if necessary to get every core draining properly. It is very important to get all the cores drained properly so they can dry out between rains. The sealer can also be hung all the way up the wall for a semi-finished, maintenance-free wall. After the walls are taken care of, it is time to filter the trench and sump hole with a good filter material that will not rot away. I use a professional grade landscaping cloth made from recycled plastic. After placing the filtration material in the sump pit hole, I cut the three-foot roll in half with a Sawzall and line the trench from the footing to the edge of the floor. This filter will keep any type of sediment from entering the system. Now it's time to install the drain tile around the perimeter of the basement, with ninety degree angles in the corners as needed to create a continuous loop that ties into each side of the sump pit. Most of the water will flow through the bottom of the trench and seep through the small holes perforating the sump pit. When the water runs faster, it will get into the four-inch pipe and pour through the pipe into the pit. I save and reuse fist-size pieces of the old concrete floor which I place along both sides of the pipe to hold the filter and pipe in place until the pipe is rocked and the trench is filled and graded with clean gravel. I normally use river rock if available. It shovels and grades well and has already spent millions of years in the water. After the system is rocked and graded, the walls and floor can be hosed off with water and the sealer scrubbed with a mixture of soapy water and bleach. The next thing to do is to replace the concrete floor. I get a palette of bags of concrete on the back of the truck and mix three at a time in the mixer. I then pour the cement into a mortar box and shovel it into buckets. These buckets are passed through a window or carried down the stairs to be emptied into the trench and leveled out with a magnesium float. As the concrete begins to cure, it can be floated and troweled several times until it is flat and smooth, matching the old floor. It is very important to get a smooth, flat finish on the new concrete. It is very difficult to lay any type of flooring over a rough, wavy floor and make it look nice. Finally, it's time to install the sump pump. You want to install the best pump you can get with a check valve to prevent the water from coming back down into the pit, and attach an exit line that takes the water far enough away that it will not come back into the house. I prefer to use the Zoeller M53 one-third horsepower pump. 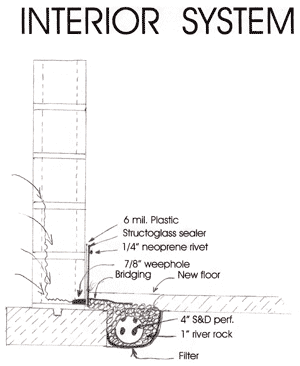 This is the description of a good waterproofing system that will work as long as you have a pump that can keep up. Building code for basement waterproofing says you must have an approximately eight-inch by eight-inch trench lined with a filter and filled with a bed of gravel or pipe and gravel. There are many systems on the market that do not meet this code. If they do not meet basement waterproofing code, then how can they be called basement waterproofing? In my professional opinion, systems that do not meet building codes for basement waterproofing such as track systems and baseboard systems are designed for fast, easy installation and have eliminated most of the physical labor from the installation process. Therefore, they should cost much, much less. These systems are not large enough to handle the amount of water that is introduced in extreme conditions. They do not lower the water table the way a trench does because they are normally on top of the footing. This means you will still have water coming up through the floor. These systems then become dark, moist insect farms and most of them allow radon gas to free-flow into your home. Now they even have shorter sump pits that require much less work to dig the sump hole. These systems, in my opinion, are designed by people who want to make money in the waterproofing field without carrying buckets or using shovels. If they can design, patent, and market a product, it doesn't seem to matter to them whether or not it works, as long as they make money. I get regular phone calls from people who sell these products telling me how they can raise my profit margin and lower my overhead. They can even provide numbers for all expenses so you know how many systems you will have to install before an early retirement. To me, this sounds more like a get-rich-quick scheme. I prefer to make my money the old fashioned way: I earn it! This way I can see old customers everywhere I go and they smile, telling me they haven't had a drop of water in their basement, or that my basement waterproofing was one of the best investments they made.